Use the illustration and instructions below to measure your garage roll up door. Take these measurements and call us to purchase the roll up door that is right for you. Step #1 Measure the width of the rough opening at the widest point. This is the distance between the right and left sides of the rough opening. Look for general irregularities, such as jambs which are not square. Step #2 Measure for side room - 4" - 9" (depending on door) is required on each side for installation of the vertical track, this area needs to be capable of flush mounting the tracks and clear of any obstructions. See Check Clearance page. 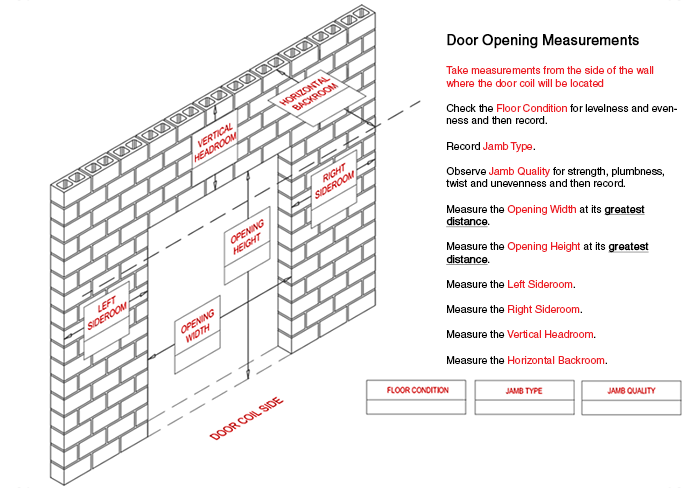 Step #3 Measure area labeled "headroom" – distance between the top of the door opening ("jamb header") and the ceiling (or ceiling to floor joist) 15 ½” of headroom is required for a 7’ and up, 7’ to 8’ 8” requires 16” of headroom and 8’ 9” to 10’ requires 20” headroom (examples taken from model 650, check other models for their headroom requirements). Step #4 Measure area labeled "back room" – distance is measured from the door opening toward the back wall of the building. Verify electrical outlet for door opener use. Note any lights or stairs in the way. Verify all jambs are in good condition, header is stable. Verify the level of the floor. Was the previous door a custom fit? Note any pipes, ductwork, etc. above the door that might obstruct operation of the door.